Few books of the Bible seem scarier than Ezekiel — 48 chapters of weird and wonderful visions, bizarre street performances and blood-curdling judgments. Perhaps you’ve wondered what it’s all about. But, will you ever have the time to study such a large book? Does this stuff really have anything to say to you? Here is a Bible-study course that will take you through the whole of Ezekiel in SIX sessions! This whistle-stop tour gives a clear overview of all the main themes of Ezekiel’s prophecy — God’s glory, judgment, and hope — focusing on key passages that explain the surrounding chapters. But more than that, you’ll discover how God’s Word to His exiled people is truly fulfilled in the gospel of Jesus and the experience of Christians. ‘Then they will know that I am the Lord’ is the repeated message of Ezekiel. In a world of false hopes that will ultimately fail, this is a message for everyone. We’ve been going through Ezekiel in our sermon series at church and I thought this guide would be useful to go through in my quiet time devotions. It’s been excellent, really helpful guide with probing questions and useful links to other passages for relevant application. I’d highly recommend it for anyone who would like a better understanding of what God is saying through Ezekiel. We were a bit daunted at the beginning of the study as we doubted whether six studies was enough for such a challenging book. We found, however, that the studies encouraged all of us to read the whole book and then focus on specific areas during our housegroup. The application questions helped in this process stimulating prayer and discussion on what God is saying to us in our everyday situations. We were also reminded that we serve an awesome God. 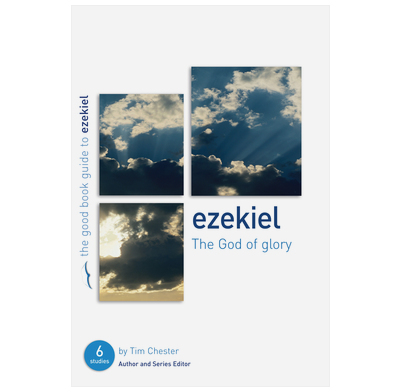 We had a great time going through Ezekiel with this guide. It really helped remind us of God's greatness, holiness and sovereignty and enabled us to get to grips with Ezekiel's message of judgement and hope for both Israel and the nations. We covered the material in six sessions but it could easily merit taking two weeks over each unit for a total of 12 weeks. Unsurprisingly it didn't address all chapters, but addressed each section. I was doing the studies in my quiet time each day - I enjoyed them and found them very helpful. We have just finished using thid with our homegroup and although a little tough going at times it was a real challenge and great to see how an often unread OT book is so relevant today. We've just used these studies in our home group - they are certainly the only way we could ever get our noses into Ezekiel! We found the big view of God inspiring and were constantly challenged to put our hope in Him alone... The series was easy to adapt to our group (we have 50-60 mins, mostly fairly new Christians, and I'm used to preparing my own studies) and leaders notes were helpful. While the application sections were mostly helpful we occasionally struggled to see the link between the passage and the application questions (e.g. pages 8 & 38) and we'd never have time to follow all the suggestions of other passages to look at. Overall, though, it helped us get a glimpse of a big God through a big Bible book! The guide was extremely helpful in guiding our reading and discussions so that we had a very good over-view of the whole book in 6 sessions. Ezekiel is not an easy read, and the guide kept our attention focussed on the main points. The application questions helped us to explore what God might be saying to us today, so making our housegroup study time relevant for each of us.